This page is intended to answer most of the questions that bands, callers and dancers might have about contra dances sponsored by the Portland Country Dance Community (PCDC). 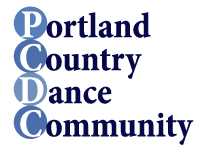 PCDC dances are held on the second, fourth and fifth Saturdays of the month at the Fulton Park Community Center, 68 SW Miles, in Portland, 503-823-3180. (First and third Saturday dances are held here also but are sponsored by other groups.) There are occasions (such as the Portland Megaband dance and the Dusk-til-Done dance) when Saturday dances are held in other locations, and PCDC also sponsors special dances (e.g. New Year’s Eve) that are usually in other locations as well. These are noted elsewhere on the website. The evening schedule is flexible except that all staff should arrive at 7:00 and the dance workshop should start promptly at 7:30 because PCDC gives a discount for dancers arriving in time to participate. The last waltz should end by 11:05 to allow enough time to clean and vacate the building. The band warm-up during the workshop should be minimized to avoid distractions for the newcomers. Doing the sound check after the workshop is completed will help and also provide a musical introduction to the evening. Our dances often include several newer dancers. Callers, please help us welcome these folks with a well-taught workshop and more basic dances early in the evening. It is also appropriate to include a brief (5-minute) style pointer during a walk-through before the break. Then keep the old-timers happy with more challenging dances after the break. PCDC allows musicians to sit in behind the band unmiked, at the discretion of the band. Please note that alcohol is not permitted on the premises of any PCDC event. PCDC pays a guaranteed minimum sum of $70 each to the caller and to each band member up to four members. In addition, any profit that remains after all expenses are paid (rent, sound, publicity, caller and band guarantee) will be distributed as equal shares to the caller, each paid band person (up to four members,) and PCDC. Please note that the IRS requires PCDC to report any income in excess of $600 that it pays to any individual in a calendar year. PCDC also pays a fixed sum for travel expenses. Again, the amount is paid to the caller and each band member up to four members, and is based on where the band members and caller came from for the dance. ** – Be sure to replace the “(at)” with the usual “@” symbol.